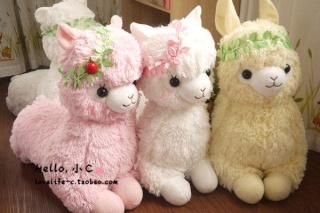 @alpacaxy What color is your alpacasso? I have two large alpacasso, one white rainbow series and one brown heartful. The brown one (named Coco) seems to be a different texture from the white one (Chib Chib). When I brush Coco his fur comes out sometimes, just like you described, but Chib Chib NEVER sheds, and neither do my offbrand babies with similar fur. I think maybe it just depends on the alpaca? I think it might actually be some type of high density foam that they used in the early kids but I'll have to double check mine when I get home. idk if that will affect the washing process too much or not. Did anyone machine wash not pastel but darker alpacasso? Black/brown/dark blue/magenta?.. Does anyone know how to remove the scratches from the eyes and make them shiny again? @Wai wrote: Does anyone know how to remove the scratches from the eyes and make them shiny again? A couple of mine have scratched eyes and a while back I bought some black nail polish to see if that would work! @Celestialsouls7 wrote: @alpacaxy What color is your alpacasso? I have two large alpacasso, one white rainbow series and one brown heartful. The brown one (named Coco) seems to be a different texture from the white one (Chib Chib). When I brush Coco his fur comes out sometimes, just like you described, but Chib Chib NEVER sheds, and neither do my offbrand babies with similar fur. I think maybe it just depends on the alpaca? If I don't remember wrong the shedding happened with my 2013 Christmas series pacas (3 white and 1 pink, all large). Hmm I never considered that the shedding could be due to different fur textures! But you're right, it could be a possibility! I hang (yes, hang) them until the sun sets. I start washing them in the morning so one day.